This pillow looks comfortable in this photo, but how about when she changes position? Most traditional pillow types simply do not provide adequate neck support. A lack of proper support can cause neck, shoulder and back pain. 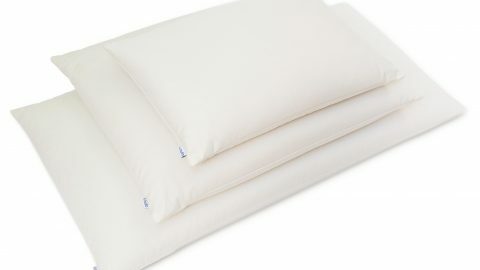 Traditional pillow filling may collapse under the weight of your head during the night, resulting in a uncomfortable downward bend in your neck. To compensate, people often stack 2 or more pillows, which can inadvertently create an upward bend in their necks. Both scenarios can strain muscles and/or pinch nerves, leaving you with aches and pains the next morning. Suffering from sleep-related aches or pains? A neck support pillow might help. Neck support pillows are designed specifically to help you achieve better sleep posture. They are meant to help your head, neck and back sustain a “neutral” position. Neutral alignment keeps all the bits and pieces in your back in in their ideal positions, preventing unnecessary pressure on your discs, muscles and nerves. Keep your spine neutrally aligned and you’ll avoid discomfort (or worse). Most neck support pillows are rather unusual compared to traditional pillow types. They are often oddly shaped. The predominant neck support pillow design is called a “contour” pillow. As the name suggests, contour pillows are modeled to the contour of a head and neck; most are shaped like a trough or a bowl, with a space cut out of the middle to cradle your head and a bulge at the edge to support your neck. 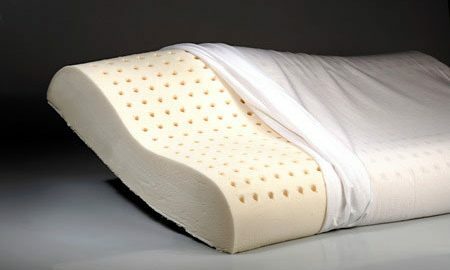 These are typically made of synthetic poly foam, while more recently memory foam has become quite popular. There’s a problem with most neck support pillows. 1. Many neck support pillows are designed for a static sleep position; they’re not adjustable or malleable. Foam, latex and memory foam neck support pillows generally come in a predefined geometric shape. They’ll compress and conform to your head somewhat, but they cannot be shaped, fluffed or molded to support a variety of different sleeping positions. Research shows that people change positions between 3 and 36 times during every sleep period. A preformed foam pillow is not optimally shaped for many of these positions. Thus, when you shift in your sleep, you’re not getting the proper neck support and potentially worsening any sleep issues you might be trying to correct. 2. Typical neck support pillows do not allow you to adjust the pillow thickness. Together, your body shape, the firmness of your mattress, and your sleeping positions make a unique space between your head and the mattress. Because this space is so specific to you, most neck support pillows don’t effectively keep your head properly elevated. This is simply because they’re not adjustable; they’re either too thick or thin. If you’d like to try a non-adjustable neck support pillow, be particular about the loft. Try different models to find one that elevates your head to what you feel is best for you. 3. Finally, most neck support pillows are made from non-breathable materials, so they tend to retain the heat generated by your body. Additionally, their odd shape prevents most neck support pillows from being flipped to the cool side. More breathable pillow filling types will help keep your pillow cool. No single pillow works for everyone. If you’d like to try a neck support pillow, do it right. Squeezing a pillow inside plastic packaging at the store isn’t the way to find it. You really need to test drive them in your own bed. Check the manufacturer’s return policy and make sure that you’re able to try it for at least a week. If it’s not right for you, toss it back in the box and return it. You spend a third of your life with your head resting on a pillow, so a little shopping and experimentation is absolutely worth it. 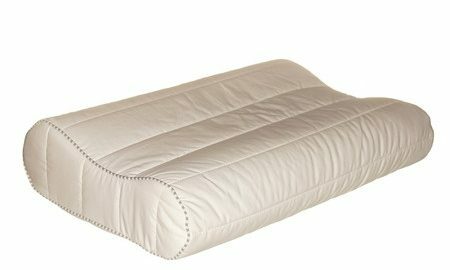 A buckwheat pillow is a great alternative to a traditional neck support pillow. The irregular shape of these tiny hulls gives them a unique malleable quality that makes them superior to other pillow fill types. They’ll conform perfectly to the shape of your head and neck providing ideal support that’s just for you. Most buckwheat pillows have a zippered opening that allows you to adjust the thickness to your personal preference by adding or removing hulls. What’s more, there’s lots of free space between the individual buckwheat hulls so that air can flow freely through the pillow keeping it cool and dry even in the hot summer months. Don’t take our word for it: read our customers’ reviews. We think you’re agree that Hullo buckwheat pillow is a terrific neck support pillow. Give Hullo a try for 60 nights and if you’re not satisfied, just ship it back to us for a refund. Give Hullo buckwheat pillow a try for 60 days.